BMInt’s far-flung correspondent Mark Kroll recently returned from China, where he gave concerts, lecture-recitals and classes in Beijing and Shanghai. He enlarges about the music he shared with new Chinese friends and colleagues, and what he learned from them. Chinese appreciation of the harpsichord and its history and literature is just beginning. I was therefore particularly eager to make the long flight from Boston to Beijing to share what I knew, and to demonstrate how to play the harpsichord with the maximum of expression. I also decided to leap directly into the deep end, both musically and historically, by devoting all my teaching and performances to a style and repertoire that I guessed was probably unfamiliar to most Chinese teachers, students, and audiences: French harpsichord music. It turned out to be the right choice. My duties began with a lecture titled “Les Clavecinistes: 200 Years of French Harpsichord Music” at Peking University for the music history class of my host, Professor Liu Xiaolong, an excellent Beethoven scholar who has spent considerable time in the United States; he served as my translator throughout the trip. His extremely bright, curious and enthusiastic students reinforced my assumption that most knew little or anything about the French Baroque. The next day Xiaolong, my wife Carol Lieberman, (who accompanied me and will probably be returning to China in November to teach Baroque violin and its repertoire), and I flew down to Shanghai, where I performed a lecture-recital of “Les Clavecinistes” on a fine Hemsch-model harpsichord built by Neupert, in a beautiful little concert hall (which seemed to have been designed Parisians). French harpsichord music on a French style instrument at low pitch and with a historical tuning in Shanghai—not bad at all! Again, the repertoire and the clavecin style proved new to most of the listeners; my mission seemed to win over at least a few converts. Returning to Beijing as the guest of the Central Music Conservatory of China in Beijing, I was in the capable hands of Shen Fanxiu, professor of harpsichord and organ there. Fanxiu had lived and studied in Vienna for 12 years, so our conversations were mostly in German. Yes, an American harpsichordist speaking with a Chinese harpsichordist in Beijing in German (plus a little English), but our common language was really “harpsichord,” about which we could talk for hours—with no need of a translator. For the Beijing Conservatory, I gave another lecture-recital, plus a class on national styles of figured bass realization, and a formal concert featuring the music of F. Couperin, Rameau, Daquin and Balbastre. The audience reaction to my favorite pieces was just as I had hoped, and afterwards, Professor Shen told me that I had given the first solo harpsichord recital in Beijing. I know that this is not true, but it certainly felt that way. I do think it is safe to say that most of the French music I played was heard for the the first time in China. But what did the Chinese teach me? Their history—for starters. Thanks to Xialong, Carol and I learned much about the long and rich history of his country, through the various dynasties, starting in about 2070 BCE and several lasting for 250 years or more; we eagerly explored their different styles of art, architecture, furniture, theater and music. And we also learned what Chinese cooking is really like, especially in the north. One of the more memorable events of my trip occurred after both my lecture-recital and concert in Beijing. After the lecture, a distinguished lady slowly came down from the audience to meet and talk with me. It was the 90-year-old pianist Zhou Guangren, whom I must confess I did not know. However, I did notice immediately that everyone in the hall treated her with the most hushed reverence when she approached, and they crowded around us as we discussed the music of the recital, the harpsichord and my playing (her English was excellent). I learned from Fanxiu and Xiaolong that she was one of the most admired, almost legendary pianists of China, and made and continues to make important contributions to music education in her country, while having experienced many of the challenges of living and working in Mao’s China. The Cultural Revolution treated her particularly badly: she was forced to abandon her piano, and worked plowing fields and cleaning sheds for 10 years; it was just too much for her husband, who committed suicide out of humiliation and despair. What an honor to talk with her! I was therefore deeply moved that Madame Zhou had come to both events, and that she told me she loved my playing and, more importantly, the music I played. I am looking forward to returning to China—to teach and to learn. Having known and enjoyed Mark Kroll’s work for years, I can only imagine that his lecture-recitals and concerts were of a very high calibre. But it must be pointed out that, the blandishments of his hosts notwithstanding, the harpsichord and its repertoire are by no means new to China. I find it a bit puzzling that he appears unaware of this. Leaving alone the ancient history, which goes back to the activities of the Jesuit Matteo Ricci well over four centuries ago, there is a modern history that is at least 30 years old. In the mid-1980’s a Canadian named Ted Turner collaborated with the Beijing Conservatory’s Chief Instrument Technician, Zhao Dongsheng, to build two instruments. The respected Australian builder Carey Beebe has been active in China for at least 20 years. Most notably, the well-known American harpsichordist and scholar Joyce Lindorff has been teaching and performing actively in Shanghai, Beijing, Xi’an and other cities since the 1990s, when she was living and teaching in Hong Kong (she’s now at Temple University). 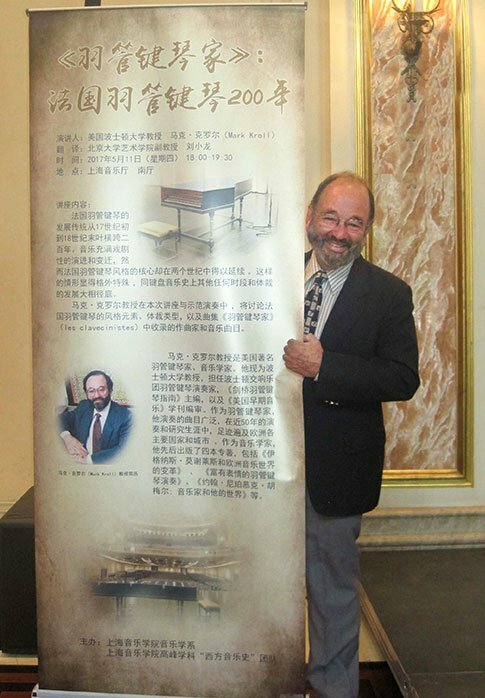 These are only a few of the most prominent people to have contributed their efforts to raising the awareness and the performance standards of the harpsichord within China. Any discussion of “first recitals” or “Couperin premieres” in China would have to be a discussion of their efforts — efforts that, though they go unmentioned in Mr. Kroll’s otherwise commendable report, have benefited him greatly, for it was the work of these individuals that eventually created sufficient awareness of the harpsichord for Mr. Kroll to have received his invitation to visit. I thank Mr. Fiske for his kind and informative comments, but please let me assure him and our readers that I never meant to imply that there was little if any history of the harpsichord in China, both ancient and recent. If I left something out, it was never because of intent or ignorance, but rather the focus of this article. I do know the works from the Jesuit period, the sonatas of Teodurico Pedrini in particular, and I am well aware of the excellent collaboration of Mr. Turner and Zhao Dongsheng. I am, moreover, a great and long-time admirer of my friend and colleague Joyce Lindorff, including her pioneering work in China, as a performer, teacher and musicologist. It is from her that I first heard of Pedrini. I have been a fan of Carey Beebe’s consummate technical skills for almost three decades, and appreciate all of his work on the harpsichords I play, including those in other Asian countries. 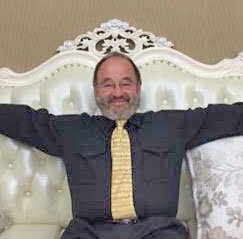 I was therefore pleasantly surprised to receive a message from him, from Australia, the morning after my Beijing recital to congratulate me. I had no idea how fast news travels with social media. That said, the art of playing and building harpsichords is indeed taking its first major steps (e.g., I was told that the harpsichord I used in Shanghai had to be borrowed from the symphony), but knowing the skill, resources and dedication of its current practitioners, I have no doubt that there will be harpsichords and harpsichordists throughout the country in a very short time.